What is the SOAR Program? The SOAR Program is Misericordia University's Student Outdoor Adventure & Recreation Program, housed in the Student Engagement office. SOAR uses the outdoors as a medium to foster growth and development of leadership skills both at individual and group levels. It provides students with opportunities to safely participate in value-based outdoor activities. SOAR works to instill an appreciation for nature and a willingness to gain experiences in unfamiliar territories. SOAR offers a wide variety of activities that range from a quiet walk in the woods to an exciting day of rock climbing. The challenges faced in a supportive setting can serve as an escape from the stresses of student life or help to overcome fears and limitations. Its challenging activities can serve as metaphors for the difficulties faced by every college student. 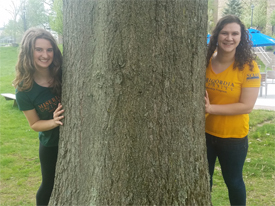 SOAR provides another opportunity for the College Community to gain a unique, educational experience in a wilderness setting. In these instances, students develop skills that can apply to any situation they may encounter in the future. For More Information, or to sign up for any of the numerous events, please contact Allison Kinsey, Coordinator of Student Engagement at (570) 674 -6411 or akinsey@misericordia.edu or simply stop by the Student Engagement office! Join us on a trip to a local indoor climbing venue to explore their routes! An excellent trip for people of all climbing levels, from those with no experience to experts! Travel with us to the Toyota SportsPlex in Wilkes-Barre to take part in community skate. End your week with some fun on the ice! Spend a day exploring the local back country! Location will be determined closer to the event, depending on weather and trail conditions. Join us on a trip to a local indoor climbing venue to explore their routes! An excellent trip for people of all climbing levels, from those with no experience to experts. You won't want to miss this night of controlled chaos and fun! Can you and your team sink the boats of the other teams before they sink yours? Enjoy a Spring afternoon climbing the routes on our challenge course tower located right on campus behind Manglesdorf field! Adventure awaits! Join us on an overnight backpacking trip through one of Pennsylvania's beautiful state forests. This in excellent trip for backpacking novices and experts alike! 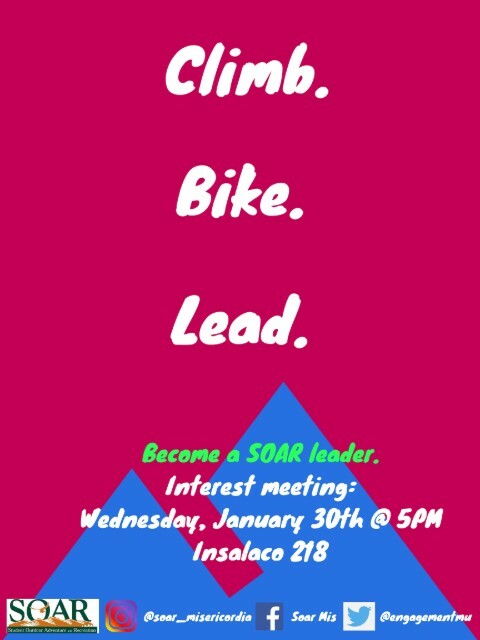 If you are a current Misericordia student and are interested in participating in the Spring 2019 SOAR Leadership Development program please attend an informational meeting on Wednesday, January 30th, at 5:00PM in Insalaco 218 or reach out to Allison Kinsey at akinsey@misericordia.edu. Does your team, club, or organization want to be more effective? Team building is a challenging group experience that helps build supportive and effective teams. Success of the group is dependent on participation of all members involved. Team building programs focus on development healthy group interactions in a lively and energetic setting. They are designed to meet specific group needs, which would be assessed beforehand with the help of a contact person. Team building can help groups become stronger and better prepared for the obstacles they face. SOAR activities raise an awareness of the natural environment in which we live. Whether it is planning an Earth Day celebration or a service project, SOAR activities focus on the concept of leaving a place better than when you came. 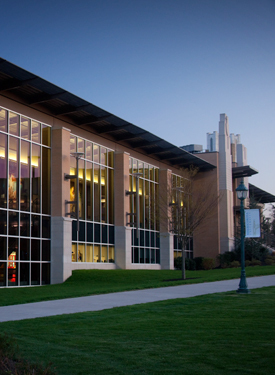 By challenging people to lead more thoughtful lives, SOAR activities reflect the mission of Misericordia University. SOAR activities focus on improving both physical and emotional health in an enriching and rewarding setting. For more information, please contact Student Engagement. To encourage outdoor recreation, SOAR provides students the ability to rent quality outdoor gear at reasonable prices. All equipment is maintained in excellent condition and inspected regularly. Rentals available for one through nine days. Equipment is provided to participants free of charge when participating in SOAR activities. At this time, SOAR does not rent canoes, kayaks, or climbing ropes. This equipment is available on all SOAR-sponsored activities. 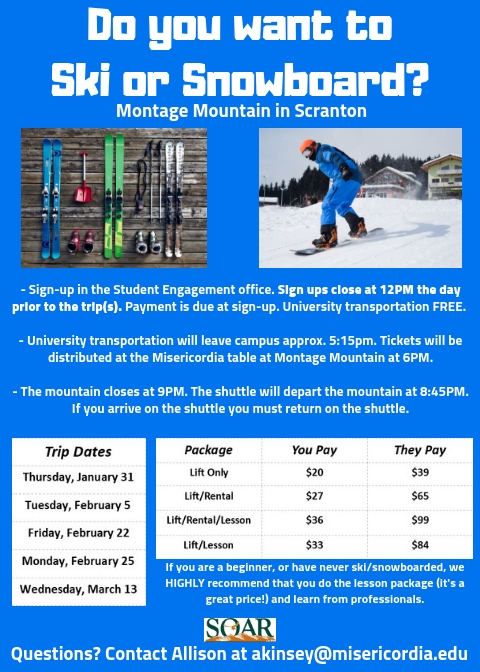 SOAR offers several Essentials Workshops throughout the academic year that are open to the Misericordia community wishing to develop or hone their outdoor skills. These are designed to allow students to learn in a safe and supporting environment. Some past workshops have included Orienteering, Leave No Trace, Belaying, and Snowshoeing. Additionally, SOAR sometimes offers specialty training opportunities, such as certification in Wilderness First Aid, open to the Misericordia community. Interested in the Challenge Course? Don't forget to sign the permission waiver!